The Milky Way and other spiral galaxies each house about 1,000 to 2,000 giant clouds that contain enough dense gas and dust to form hundreds of thousands of sun-like stars. According to a new model, an encounter with such an interstellar dust cloud could have triggered global glaciations on Earth that occurred 600 million and 750 million years ago. 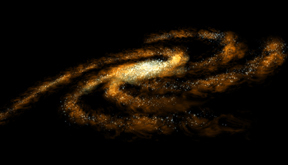 Within the spiral arms of the Milky Way galaxy are thousands of giant clouds of dust. Some researchers now say that these clouds collide with Earth every 140 million years, possibly explaining the causes of two distinct periods of widespread glaciation in the planets geologic past. Courtesy of NASA. Although geologists generally agree that volcanic greenhouse gases could warm Earth enough to pull it out of an extreme ice age, they have not yet reached a consensus on what might initially plunge it into one. The snowball Earth theory, the leading explanation for what happened during these glaciations, holds that, at least twice in Earths history, expanding ice sheets reflected back increasing amounts of sunlight, further cooling the planet in a runaway albedo effect. Eventually, the ocean surface froze and glaciers reached the equator. To explore the trigger for such an event, Alexander Pavlov of the Laboratory for Atmospheric and Space Physics at the University of Colorado, Boulder, and colleagues modeled the aftermath of Earths passage through giant clouds of both carbonate and silicate particles. They concluded that a collision with a very dense cloud could inject enough dust into the atmosphere to reflect sunlight and trigger the runaway albedo effect. And, if conditions on Earth were already approaching an ice age, a collision with a cloud of average density could tip the balance, they report in the February Geophysical Research Letters. The researchers estimate that Earth passes through a dense cloud once every billion years and a cloud of average density every 100 million years. However, this timing and evidence of perturbations in the carbon cycle prior to the onset of snowball Earth events point to an earthly cause, says Daniel Schrag, a geochemist at Harvard University. Why would this happen twice? Schrag asks, within a 200-million-year period. Although he is not particularly fond of any hypothesis, Schrag says that the arrangement of continents at low latitudes better explains the geologic record, and why the snowball events happened only a few times in Earths history and have not occurred again since. The ratio of carbon-13 to carbon-12 in carbonate rocks for tens of millions of years prior to the snowball Earth events is the highest ever in the planets history, Schrag says, indicating a high level of biological activity, which takes carbon-12 out of the cycle. This activity would require large amounts of phosphorus, a nutrient that is released from the sediments in some river deltas. Rearranging the continents at low-latitudes would concentrate the worlds rivers near the equator and increase the amount of phosphorus available, Schrag says. Just imagine you have four Amazon Rivers instead of one, he explains. Additionally, the continents, now lacking the protection of ice caps, would be exposed to weathering, which cools the planet by drawing the carbon dioxide from the atmosphere, providing another possible trigger for snowball Earth. Pavlov argues that these geological triggers arent rapid enough to explain the abrupt onset of a snowball Earth event, whereas a dust cloud encounter would be sudden. He also says that Earth has a sufficient probability of encountering a dust cloud every 140 million years, which is consistent with the timing of the glaciations. Models are not enough, however, Schrag says. We should be open to all sorts of new ideas, and any new idea on this is interesting, he says. But its also important to pay attention to the geologic record. Pavlov suggests that geologists look for evidence of a dust cloud encounter, for example, an increase in the uranium isotope ratio in sedimentary rocks deposited at the end of the glaciations.